In this video, you'll learn how to create mini sprites that fly across the screen. In Scratch, you can create a copy of an object using the create clone block. The clone will have the same attributes and characteristics as the original object. 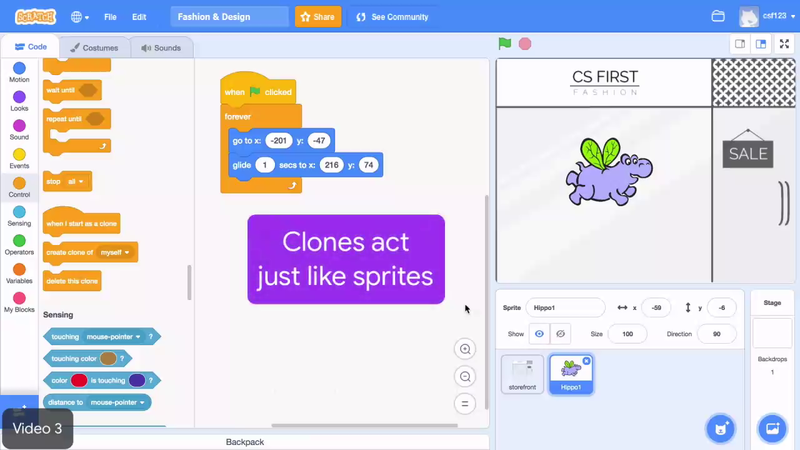 When you program the computer to create a clone or copy of a sprite, you can provide instructions or code for how the copy should look and function. Without instructions, clicking the create clone of myself block will make a clone of the sprite appear on the stage, but the clone won't fly or do any other actions the original sprite performs. Use the when I start as clone event block to provide instructions that will make the new clone perform an action. Add a when I start as clone block and drag your go to and glide block stack under this event. Now, whenever you click the create clone block, the clone receives instructions telling it to fly across the screen. Clicking create clone multiple times makes several clones fly across the screen. To automate the cloning, drag the create clone of myself block into the forever block. Wow, that's a lot of clones trying to cross the screen at the same time. Add a wait block to the forever loop to slow down the clone creation. Adjust the value in the wait block until you like the clone creation pace. You now have several clones zipping across the screen, but they don't disappear when they reach the right side of the screen. To fix that, add a delete this clone block after the glide block. You might also want to drag your flying sprite to one side of the screen. Computer scientists like you often need to test several solutions to a tough problem before they find the one that works. If your code isn't working correctly, keep trying different fixes until you solve the problem. Add the event, when I start as clone, and place the code that makes your sprite fly under it. Add create clone and wait blocks to the forever loop. Add a delete this clone block to the bottom of the stack. Create a clone of the sprite. Make the clone fly across the stage. Make many clones fly across the stage. Slow down the clone creation process. Make the clones disappear when they complete their flight across the stage.